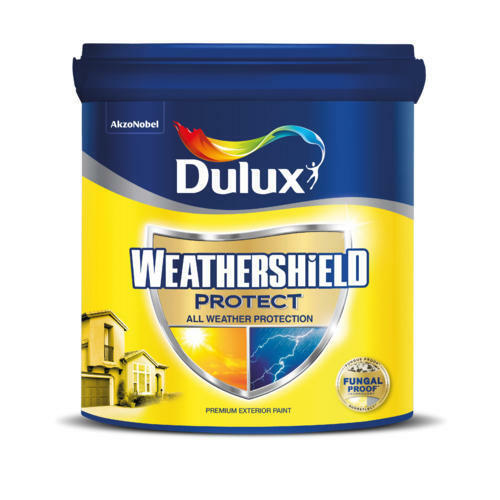 Dulux Weathershield Protect is a high-performance premium exterior paint that protects your home from the damaging effects of all forms of weather, especially rain. It’s powered by ‘Fungal Proof’ technology’ that resists the formation of ugly black spots and fungal patches. It also comes with special SunReflect pigments that reduce surface temperature up to 5 degrees to keep your homes cooler. 5-year protection against all weather conditions. ACTIV Technology for superior algae and fungus protection. SunReflect Technology - reflects 2 times more light than a regular exterior emulsion keeping your home up to 5 degrees cooler. Our company is a leading global paints and coatings company and a major producer of specialty chemicals.